Miele Vacuum Cleaners – Complete Selection! • We have display models on each Miele offering, allowing you to take any (or all) of them for a test drive! • Buy for now, buy for the future! The average life of a Miele vacuum is 10-15 years. • We know that there are many models to choose from and this can often be overwelhming. Our knowledge sales staff is here to explain the differences with each model so that you make the right choice for you home. • Rollier's Hardware is an authorized sales and service dealer. See below for details. What's new from Miele vacuums? • C1 classic limited edition vacuum - this hard surface sweeper is great for those looking for a high performance vacuum for low pile and smooth flooring. This vacuum was limited to only 1 production run and is offered for a hot price as a result... just $249. See store for details. 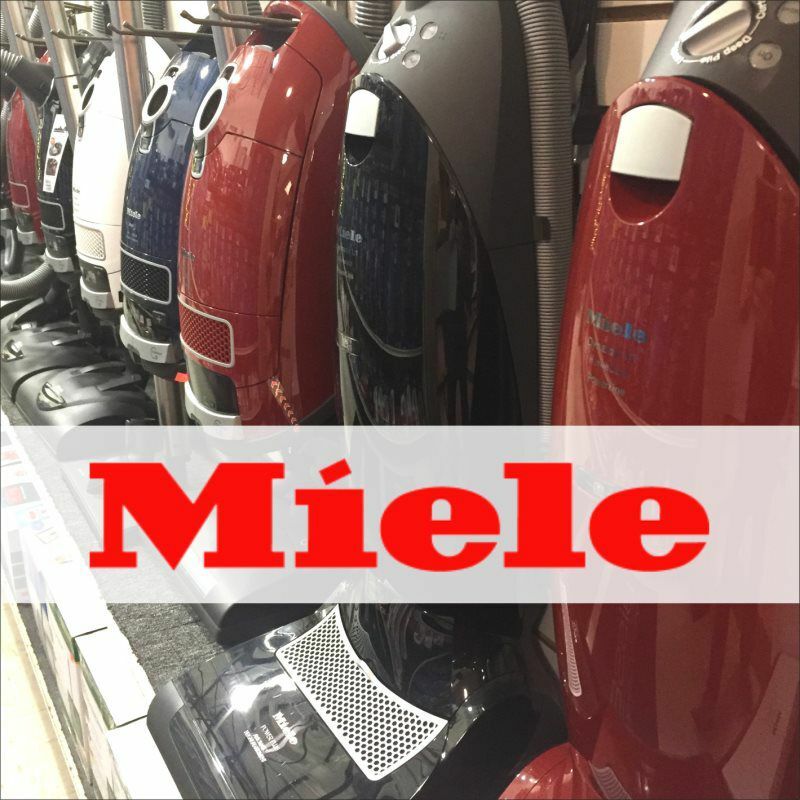 • Miele CX2 Blizzard (bagless) vacuums - this carefully curated line-up of bagless vacuums from Miele was new to our store in 2018. They offer you much of the same performance and longevity you expect from Miele vacuums, without the cost of bag or filter replacements. Once you purchase a Miele Blizzard vacuum you will not be coming back for any bags, filters, or accessories year after year. Each Blizzard vacuum comes with a self-cleaning HEPA filter, adjustable suction controls (to cater to all types of floor surfaces), and Miele's best in class 7-year motor warranty. Stop by our Housewares Dept to take one of these for a test drive! Are you tired of buying a new vacuum every couple of years? Well, a Miele Vacuum is your answer. Miele Vacuum Cleaners come with a 7-year motor warranty and typically last more than 15 years! This type of quality and guarantee are unsurpassed when it comes to the vacuum industry. Miele HomeCare models – Miele makes certain machines only for in-store retailers and these models are termed HomeCare. You will not find much information online regarding these models, but they are the best valued products that Miele makes. HomeCare means that you get a 5 year warranty on all parts and labor and 10 years on the motor! HomeCare also means that you get added value when it comes to floor tools and accessories; most of the time, you will receive an additional tool(s) for no additional charge. Stop by and see all of the Home Care models that we offer as part of our huge display. Does Rollier's repair Miele vacuums? What about warranty work? Yes, and yes! In the unlikely event that service is needed on your Miele vacuum, we are here to help. Our professional trained service technician works full-time for us and is here to diagnose and resolve any Miele sweeper issue that you might have. We pride ourselves on being quick and efficient when it comes to repairs, so that you can have your vacuum back in little time at all. 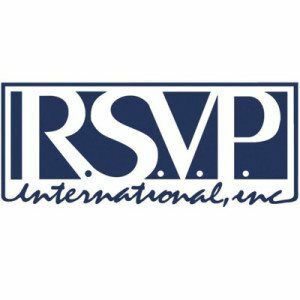 Founded in 1984, R.S.V.P International has been committed to making creative, fun and functional products for your kitchen. A catalog that started out with only 6 products, now contains over 700 products! We only carry a handful of this catalog, but the products that we do carry have some specific uses that are unique and or old-fashion that we think you will find very functional. R.S.V.P authentic Mexican molcajete, for that perfect guacamole! This mortar is made from natural volcanic stone and measures 8-1/2″ in diameter. Use for grinding and mincing of guacamole, herbs, limes, and more. Their heavy duty 18/8 Stainless Steel measuring cup set is a must have. It includes 7 pieces, with measurements from 1 cup all the way down to 1/8″ of a cup. The R.S.V.P ice cube tray is an example of an old fashion product that is sure to never go out of style. This robust tray is made of heavy stainless steel and includes a lever for popping the ice cube from the tray; no more messing around with pressing or picking away at individual ice cubes from a plastic or silicone tray! The smooth porcelain Japanese rice bowls are always a big hit. Included with this set is 6 assorted styles of traditional blue and white painted bowls. Mix and match them with your other dinnerware for a unique experience. The R.S.V.P poach pot, for poaching a single egg in an easy to use device for making a poached egg on the stove top. This old-fashion product makes just one egg – great for salads or egg sandwiches! The universal lid for all pots and pans from 7″ to 12″ is a popular item as well. This simple product fits almost all cookware in your kitchen and is great to use with pans keep to oil and sauces from splattering out the top. We stock other items from R.S.V.P, including their stainless steel drinkware, prep bowls, onion goggles, etc. We think that you will be impressed with the quality on these items, and we invite you to stop our housewares department to see these items in person. Tea Forte: The Exceptional Tea Experience! • Take your tea experience to another level! Tea Forte combines a smooth taste with an exceptional design! • Choose from a variety of loose leaf tea. We stock single steep tea assortments as well as their Loose Leaf Tea Trios. • Select varieties of teas are available in gift boxes that contain individual tea bags. We stock them in both 10, 20, and 40 pack gift boxes. 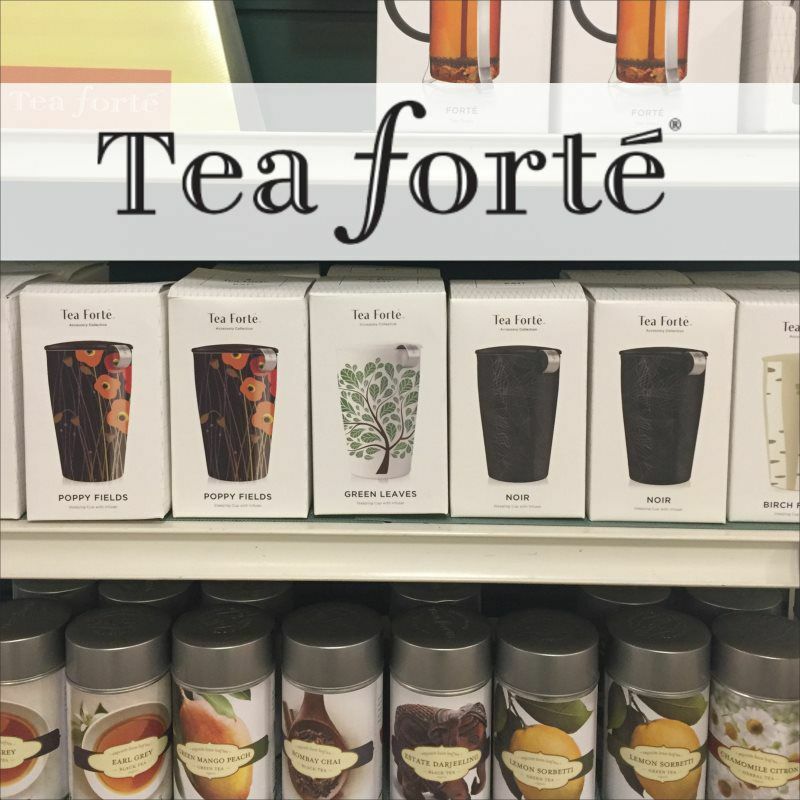 Whether you’re a tea fanatic, or just an occasional tea drinker, Tea Forte takes the tea drinking experience to another level by combining an incredibly smooth taste with an unparalleled presentation to create an experience that truly sets it apart from other teas on the market. For this reason Tea Forte has become the choice house tea at many of the finest hotels, restaurants, resorts and luxury retailers. Sampler Boxes: Availalbe in 10, 20, or 40 pack sampler boxes. We carry the green tea, black tea, and herbal tea samplers. These make a great gift for anyone on your list. Loose Leaf Tea Trios: 3 loose leaf teas each in their own small tins offer a nice variety of flavors. Availalbe in either green tea, black tea, or herbal teas mixes. Single Steep Tea Tasting Assortments. In this assortment you will receive 5 different loose leaf teas in convenient pre-portioned pouches (box contains 15 total pouches). Simply pour pouch contents into your favorite tea infusers or Kati Cup to begin steeping your favorite cup of tea. The Kati Cup (12oz Travel Mug): Tea Forte’s travel mug has been featured in Oprah’s Favorite Things catalog, so you know it’s got to be a must have! Choose from a variety of print designs. Includes steeper. Loose Leaf Tea Infusers: To steep an individual cup of tea simply put the desired amount of tea inside one of their tea steepers and steep to your desired taste! Ceramic Cups and Tea Pots: Exclusive Tea Forte cups and tea pots are available in their clean white finish. It's the perfect serving ware for your Tea Forte experience. • Safe for most all stovetops, including gas, electric, radiant ring, ceramic, halogen. 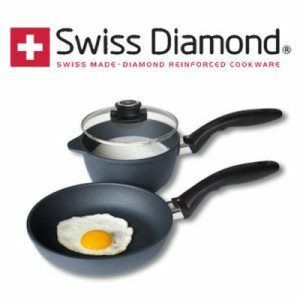 Swiss Diamond pots and pans offer the perfect combination of non-stick performance and long-lasting durability. Many of us love the way that non-stick pans perform, but we hate that they break down and often need replaced after a couple of years. The high quality, durable non-stick coating that is used on Swiss Diamond cookware is second-to-none and for this reason, all Swiss Diamond pans come with a limited lifetime warranty! What do we stock? We stock a nice selection of Swiss Diamond fry pans, including sizes up to 12.5″. We have fry pans sold with lids, as well as sauce pans, soup pots, stock pots, and crepe pans. All of these solutions have their one-of-a-kind non-stick surface that cooks wonderfully, even without oil! Swiss Diamond pots and pans provide tremendously flexibility in the kitchen, and we guarantee that it will become your “go-to” pan for just about anything. The cast aluminum body spreads heat evenly to all parts of the pan. Then the diamond reinforced non-stock coating does the rest. Once you are done sauteing on the stove top, move the pan to the oven, where all Swiss Diamond pans are oven-safe to 500 degrees! Once you finish the meal, Swiss Diamond pans are super easy to clean; because sauces and grease don’t stick to the finish, there is no scrubbing or soaking needed with these pans. Stop by our Housewares department, in-store, to get yours today! If you are looking for a certain size that we don’t carry, just let us know and we can special order for you. • Receive 10% off when you purchase 2 or more products with in store coupon! 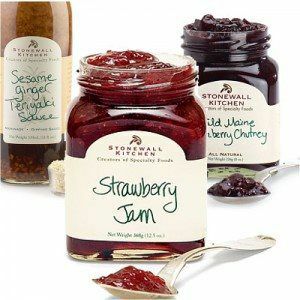 Stonewall Kitchen started in a small kitchen in Maine and now has grown to nine retail stores along the East Coast. All of their ingredients are of the highest quality and all products are made in Maine. We carry a large number of their products including jams, jellies, mustards, grilling sauces, salsa, dressings, dip mixes, syrup and pancake mix. Their line has received 26 awards since 1995 from the National Association of the Specialty Food Trade and has been named the Outstanding Product Line 3 times. Buy two items and receive 10% off with our in store coupon.